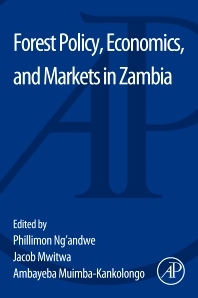 This book is the result of over ten years of field research across Zambia. It covers the production and diverse uses of wood and non-wood forest products in different parts of Zambia. Although a short format, it is a multi-contributed work. It starts an overview of the forestry sector, and covers more specific areas like production, markets and trade of wood and non-wood products; the role of non-wood forest products in the livelihood of the local population, the contribution of the forestry sector to Zambia’s overall economy and reviews of efforts to strategically utilize these resources for local economic, and sustainable, development. Philimon Ng’andwe is a Forest Industries technologist and Lecturer in Biomaterials sciences and technology at the Copperbelt University, Zambia. He has worked both in government institutions and the private sector. Philimon teaches wood anatomy, wood preservation and forest products technologies, markets and trade and has industrial and academic work experience in wood and non-wood forest products spanning over 25 years. Philimon’s research interests include both science and commerce: wood properties and anatomy, renewable bio-energy, and domestication of edible wild root, tubers and bulbs and monitoring green house gas emissions from forests industry, natural forests and wetlands. He has collaborated with the wood industry in various ways including finding solutions that enhances the forestry sector’s potential to increase its contribution to the national economy. Currently he is coordinating three projects: (1) Interim Environmental Fund Project in Central Province for domestication of edible wild roots, tuber and bulbs (2) Zambezi North South -South for teacher and student capacity building and international mobility (3) the Zambian wood web based wood xylarium database.